Small double beds are the ideal solution to having a bed in a smaller bedroom. However, finding mattress protectors that fit smaller mattresses can be a tricky task. Victoria Linen make a great range of 4Ft bedding including mattress protectors. Made in house to fit your 4ft mattress perfectly. 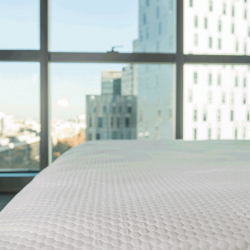 A protector is a must for keeping dirt and spills away from your mattress and so prolonging its life. Quilted or quilted + waterproof. We have 2 types of quilted protector for 4ft beds One is a standard protector with a layer of quilting to give an extra layer of comfort and protect against minor spills and dirt. We also have a quilted cover backed with a 100% waterproof membrane for total protection and peace of mind for you. We offer free samples and a brochure so you can be sure of the fabric before your buy. Please call 01706 220020 or email us for more information.